Fulton Crossing's monthly Open Studio event happens on Friday April 15, 1200 River Road, Fulton. 5–8pm. Free admission. Regular gallery hours are Saturday–Sunday, noon to 5pm. 707.536.3305. fultoncrossing.com. SECOND LIFE What was once a slaughterhouse is now home to a thriving art and studio space that's open to the public. The history of the building that sits at 1200 River Road in Fulton is not pretty. A slaughterhouse for decades, the warehouse space fell into ruin until Rami Batarseh bought the property in 2012 and spent two years repurposing it into the current industrial-chic Fulton Crossing art gallery and studio space. 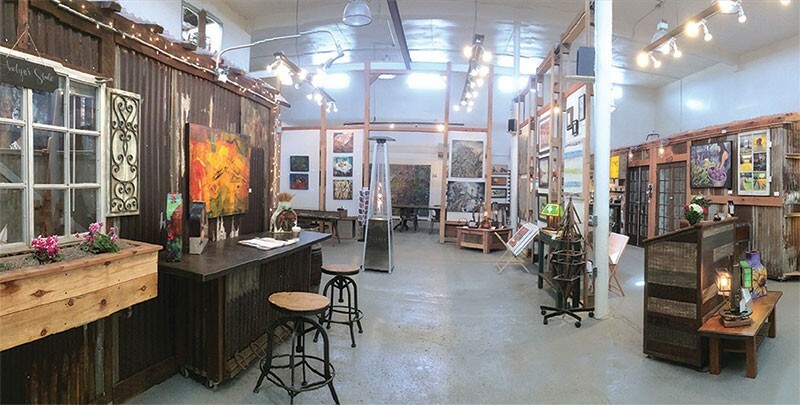 Now Fulton Crossing offers three showroom galleries, plus over a dozen art studios with 15 artists currently working and displaying their pieces. Open to the public every weekend, Fulton Crossing hosts its next free monthly Open Studios event on Friday, April 15, when the public can meet the resident artists and view their works. "We are a nontraditional gallery," says manager Karen Finkle. "We don't do things like normal galleries. A lot of times, if I have artists in their studios working, the customer gets to go in, meet the artist, see the work they are working on and purchase art from them directly." "We're taking it to the next level by not only supporting local Sonoma County art, but also exposing the artists themselves to the world," says Batarseh. "Artists like to be together, and they're here for the environment. They need the space to work, but they also want to be among everyone else and get their art exposed. It's a win-win." One of the largest gallery spaces at Fulton Crossing is dedicated to vintage furniture restorer and artist Craig Janakos, of the world-renowned Janakos & Company. "It's been a joy to see the space be rejuvenated into what it is," he says. Husband-and-wife artists Cliff and Paula Strother echo that sentiment. Sharing a space on the second floor, the pair have been at Fulton Crossing since the early days. "It's been exciting," says Cliff. "Somebody would come in with an idea, and [Batarseh] would create it, and—boom!—there would be a new studio, built from repurposed stuff. It's a little village down there." "It's gone through a lot of changes," says assemblage artist Rebeca Trevino, whose studio space is a colorful mishmash of found objects like doll parts, fishing lures and Scrabble tiles that she assembles into fantastical pieces. "Overall, it's a good work space and there's lots of activity that comes through." In addition to the resident artists, Fulton Crossing also rents out gallery space to visiting artists like Henrik Liisberg, a Danish-born artist and designer now living in Sea Ranch. "There's a lot of different styles on display here," says Finkle. "There's something for everyone."